the fash pack has never been invited to a bloggers party. about a month and a half ago, we bumped into chuvaness who was on her way to the HP vivienne tam bloggers party; she asked us to join her. eh hindi naman kami invited noh. what if we're not on the guest list and are turned away at the door?? so we skipped it. sayang, they raffled off one of those super-cute special-edition notebooks pa naman (as if we'll win). 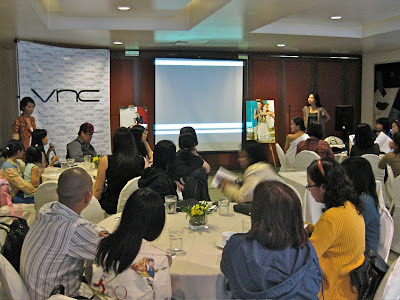 well, yesterday, we were invited to our first bloggers party by VNC shoes :-) on a saturday lang nga. a rainy saturday. a dark, rainy, bed-weather saturday. so hard to peel one's self out of bed and out of one's jammies! but we did. and we were late oops... just in time to catch the tail end of a video and the start of the Q&A. our earliest memories of VNC were back in the late 90s/early 00s, when we used to work in a fashion magazine. whenever there was a media junket to malaysia, there would be bilins galore to make pabili shoes at vincci, a malaysian brand of cheap and chic shoes. we even heard about some editor coming home with 25 pairs of shoes—all for herself! (must be an urban legend...) then they finally opened in manila under another name, VNC. the initials don't mean anything, just a shortcut, like MNG for mango. the reason is some copycat registered the name vincci in the philippines, so they couldn't use their own name here! isn't that just downright despicable? reminds us of cases filed by brands like shangri-la and ann taylor, which couldn't even use their own names and logos in this country. anyhoo, back to VNC. they have a really cool catalog that you pick up for free at any VNC store. it's shot, styled, and art directed like a fashion editorial that could appear in any vogue, bazaar, or elle.